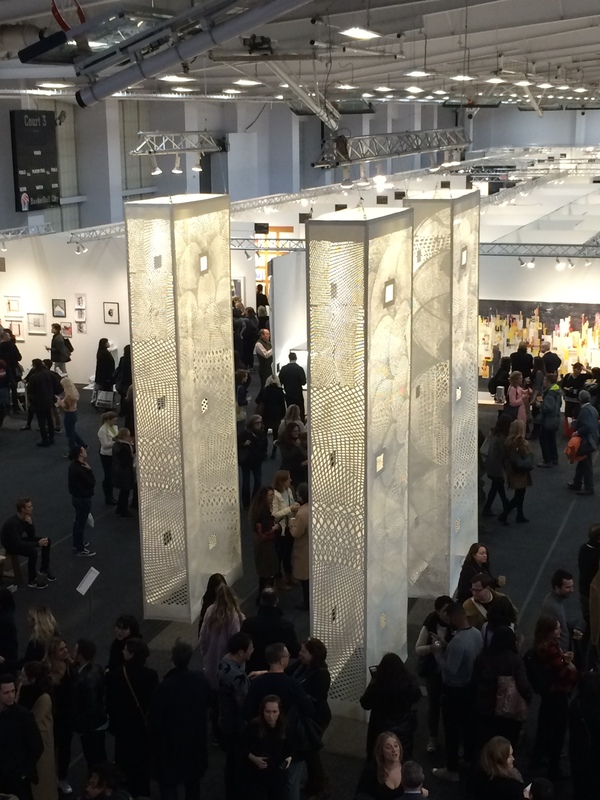 It is the first week of March, time for galleries from all over the world to display art at one of the half dozen large fairs in New York City. Since a lot of my own work involves paper, it makes sense that my first stop this year was the Art on Paper Fair. Here is just a quick overview of some of the work I thought had interesting mathematical connections. As you walk into the large venue, you are greeted by Tahiti Pehrson‘s three monumental paper towers titled “The Fates” , presented by Art at Viacom. This closer look shows the intricate paper cuts. Pehrson has used the Fibonacci sequence – obviously a favorite of mine – to develop a pattern of concentric circles. I found these two watercolor and pencil in the Cindy Lisica Gallery booth. They are the work of Chun Hui Pak. 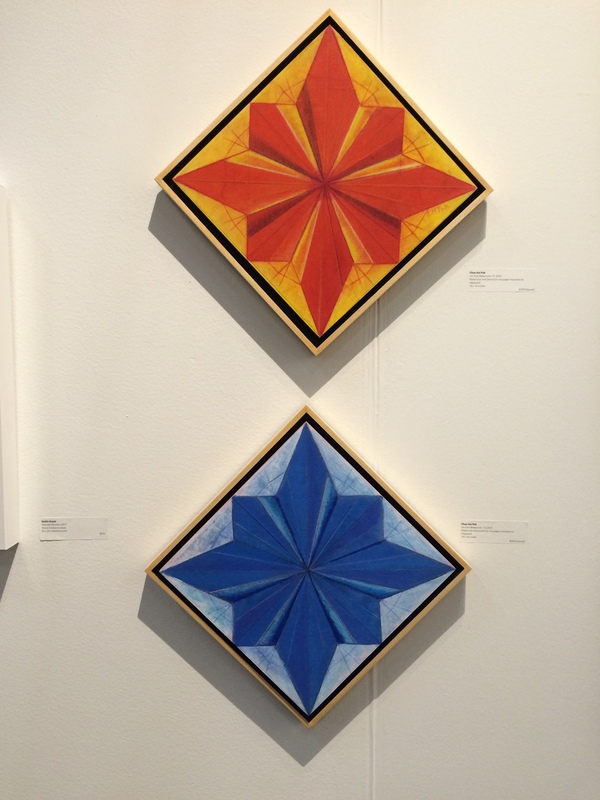 The top painting is titled “Iris Fold Watercolor 19”, the bottom painting is titled “Iris Fold Watercolor 13”. These works are 2-dimensional representations of a 3-dimensional origami sculptures. The square format is placed on a diagonal, emphasizing the order-4 rotational symmetry of the form. 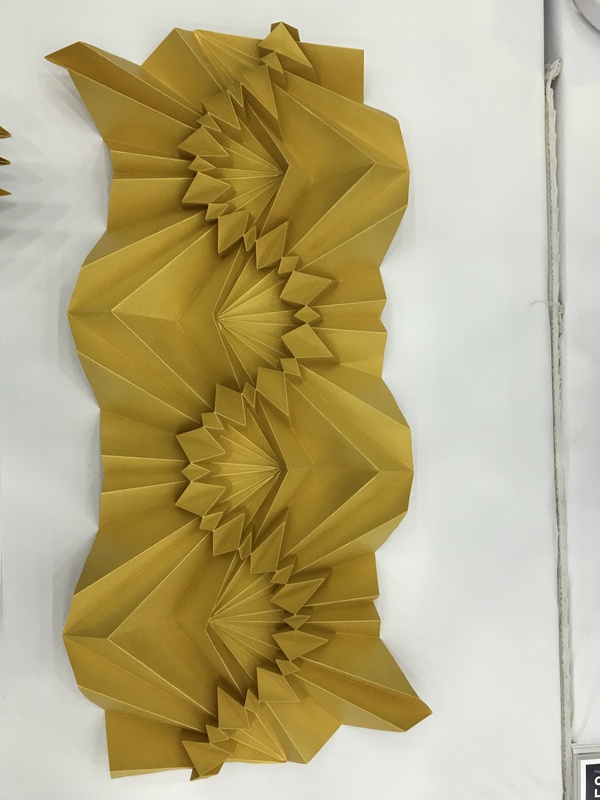 The geometry of origami folding is of great interest to mathematicians using shading techniques. Chun Hui Pak has given us a type of portrait of the paper folding. 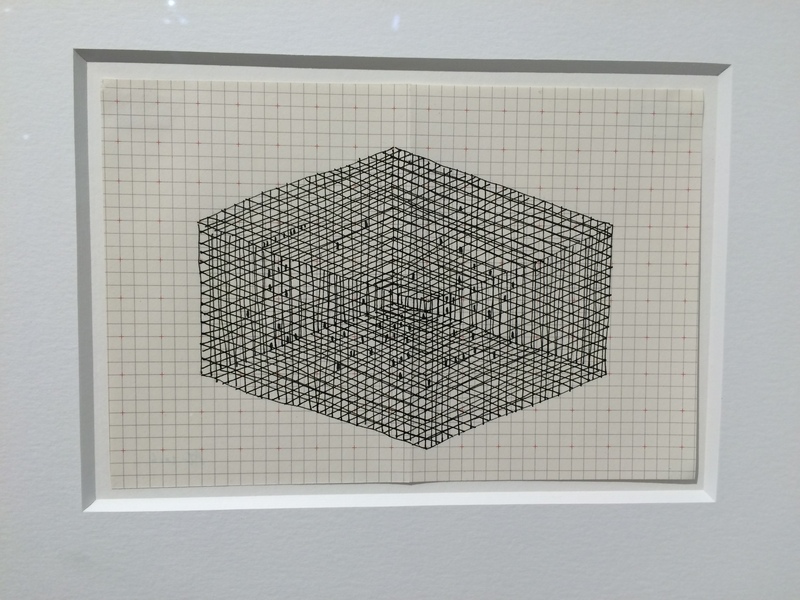 Anita Groener has made a series of pen and ink drawings that incorporate grid structures. 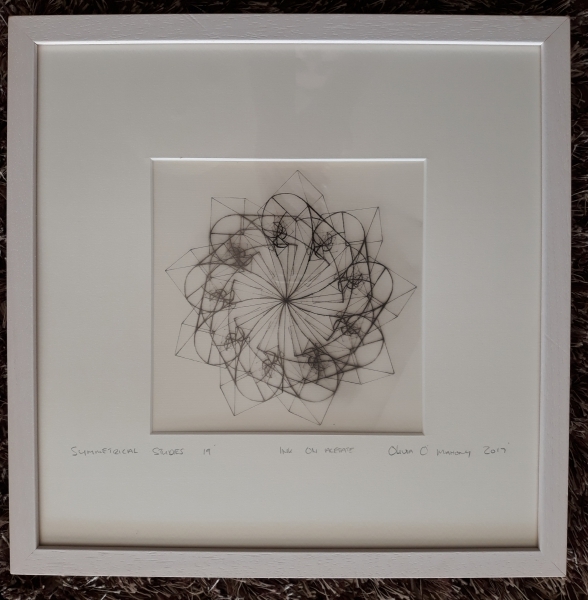 The Gibbons & Nicholas Art Gallery has the drawing “Units 3” on display. The underlying squares of the grid anchor parallel sets of straight lines that create the illusion of volume in the rectangular cage, like a prism. Although the focus of this fair is more specific to the materials used to make the art, there was a diverse selections of themes and forms represented. Art on Paper is open till Sunday March 5 2017. The iconic Flatiron building on 23rd street in Manhattan is home to the Sprint Flatiron Prow Art Space, a bright triangular room of windows, that can be viewed from the sidewalks of both Fifth avenue and Broadway. In coordination with Cheryl McGinnis Gallery, artists fill the space with interesting, temporary projects. 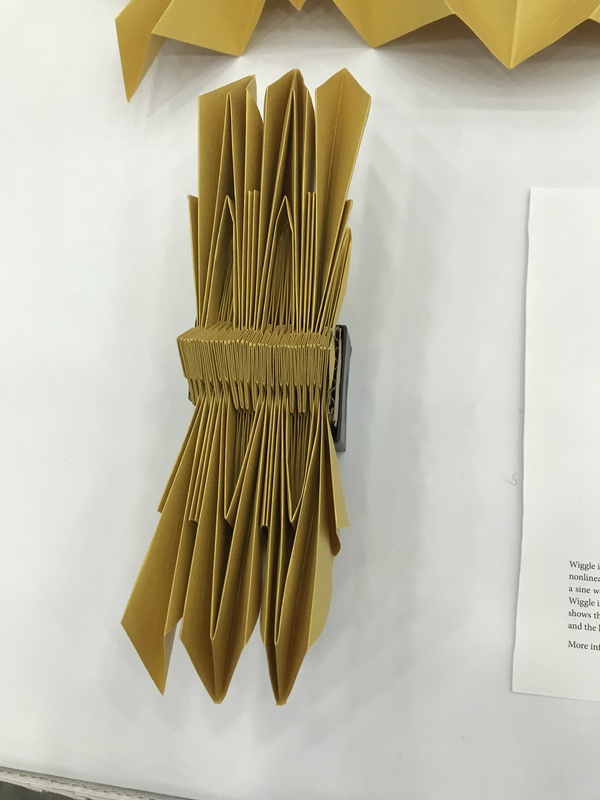 This winter, Chelsea Hrynick Browne’s exhibition “Flakes” consists of vertical strings suspended with a multitude paper shapes. Each two-sided shape is created by cutting and layering pieces origami paper. 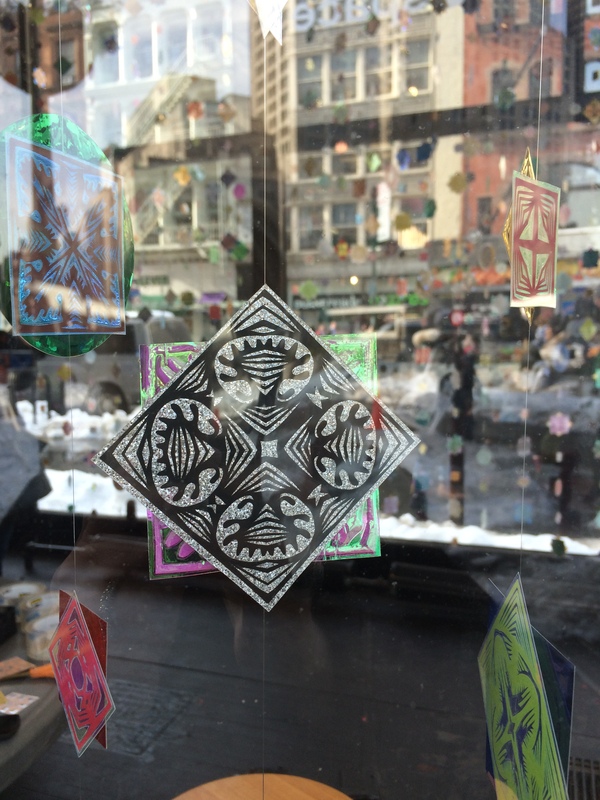 Browne’s intricate paper cutting relies on Mathematics to create the symmetrical patterns. These two examples each feature order-4 rotational symmetry. The use of contrasting colored papers affords an interesting expression of positive and negative space. Each of the flakes is two-sided. Some flakes are circular and others are square, but my favorite flakes have 16 sides. These extra special flakes are formed by two back-to-back square paper cuts with a 45 degree rotation. 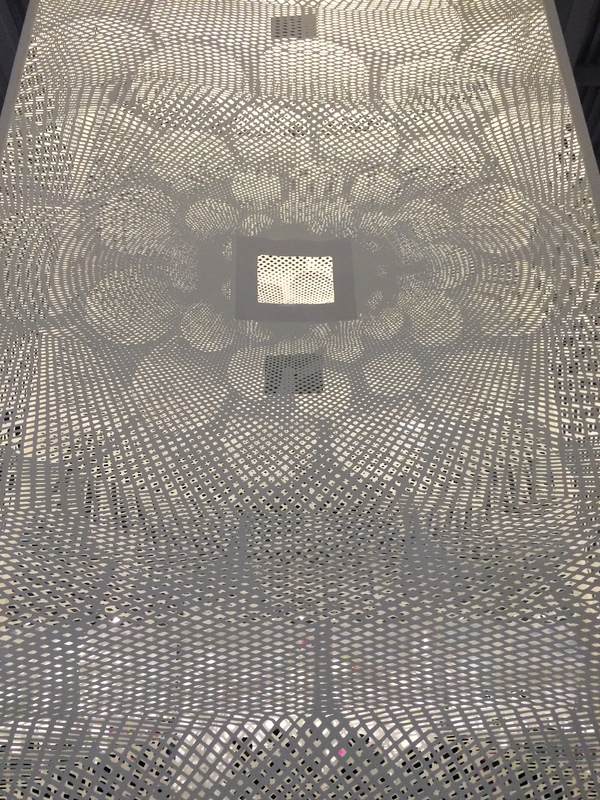 “Flakes” is a terrific installation for Winter in NYC. 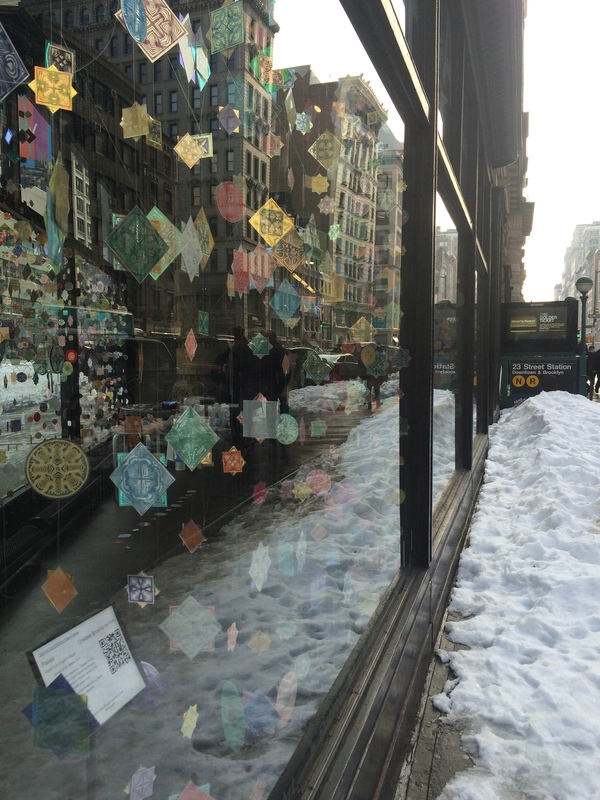 Each of the paper cut outs is different and they colorfully beckon to pedestrians navigating the snow and grey slush. I stumbled across this display and it made my whole day better. 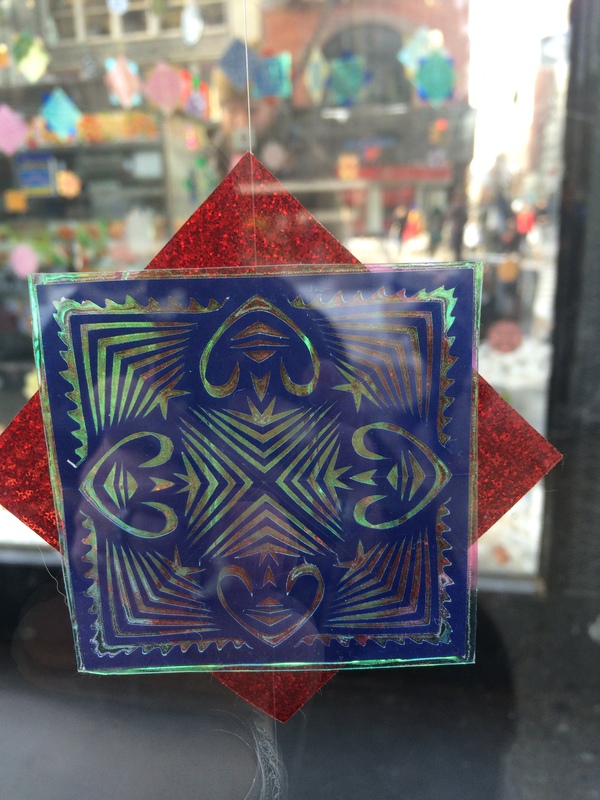 I am always amazed and happy to be able to find so many great examples of Mathematical art as I go about town.